Time doesn’t heal all wounds. Some we just carry with us, our faces flushed with shame when the memories surface. 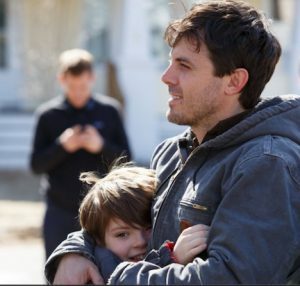 Manchester by the Sea, the latest film from director Kenneth Lonergan, is about a place where regret — like the grey skies of Massachusetts — is a constant feature. Casey Affleck stars as a man known in his hometown as “the Lee Chandler.” A fog of notoriety follows him: his head hangs, his shoulders slump under the weight. It’s why Lee’s relocated to Boston, where he works joylessly as a janitor dealing with leaky faucets, horny tenants and ending each evening in a drunken stupor. But a phone call about his brother changes his plans. Joe — played in flashbacks by Kyle Chandler — has died, leaving Lee as guardian of his 16-year-old son, Patrick. Lee is expected to relocate home to Manchester-by-the-Sea, move in with his nephew and wind down his brother’s fishing business. Though he’s grieving, young Patrick’s life — as opposed to his uncle’s — is moving forward. Lucas Hedges portrays the teen as a flesh-and-blood character, juggling multiple girlfriends and a scrappy garage band. It leads to the two butting heads over Lee’s plan to relocate back to Boston. What follows is a delicate dance with Lee struggling to adjust, while also backtracking and building up to the moment that everything changed. Emerging from the shadow of his elder brother Ben, Casey Affleck has come into his own as an intense actor: confident in his stillness, content let his searching eyes do the work. While there is a similarity in this self-defeated slacker to some of Affleck’s previous roles, Lonergan allows his star to create a portrait of pain unencumbered by the usual redemptive clichés. With a sad, glazed expression in his eyes, there’s an aura of self-loathing that permeates Lee’s every interaction. He’s desperate to escape his past as well as this new role, which leads to some amusingly awkward moments. A supporting character’s sputtered line — “We’re trying to lose some kids at this point” — underlines the strength and easy humour of Lonergan’s naturalistic dialogue. America’s obsession with the blue-collar stories of its northeastern shore continues unabated with Manchester by the Sea, but these blunt, straight-talking New Englanders certainly give the film a few moments of much needed levity. It’s natural to expect a resolution and Manchester by the Sea teases us with possibilities. There’s a wonderfully delicate street scene where Lee bumps into his ex-wife, played by a tenacious Michelle Williams. The two engage in small talk, but you can see pain written across the worry lines of Affleck’s face. Like much of the film, the moment is sparse and searing. Lonergan doesn’t let his characters off easy. In the end, what makes the film stand apart isn’t its authentic flavours or visceral performances, but the story’s integrity — a rare commitment to truth that deserves to be seen.